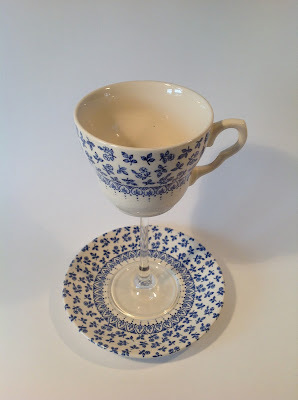 The Secret Dreamworld of a Vintage Girl: Afternoon Tea: The Tipsy Tea Cup Way! It's a fact. We all love the idea of sitting around in nice plumped cushions on a glorious sunny day, drinking tea and sharing gossip whilst staring longingly at the Victoria sponge that looks so tempting, we might just skip the diet for another week. However with our unpredictable British weather it can be difficult to achieve this. Even so, there's no harm in trying. A few years ago we fell out of love with afternoon tea. It was seen as something that only people of more advanced years did, with a nice giftcard for tea at the Ritz, or the Savoy. A very elite event, it wasn't seen as something to recreate easily at home. When Downton Abbey launched onto our screens in 2010, no one anticipated the cultural effects that it would have. Suddenly old fashioned pursuits were being touted as modern and trendy, we wanted to experience the elegance and refinery of the Edwardian era in our own homes, but how to get it without the fuss? Take one vintage teacup, place a wine glass podium and matching plate below it and what do you get? Elegant, quirky and a genius design, these are perfect for any occasion! The creators of these lovely little items are the aptly named Tipsy Tea Cups, who aim to offer "A fusion of old and new, tea and cocktails." They have managed to combine the traditional afternoon tea with a twist quite literally, with vintage teacups atop wine glass podiums, with a matching plate for balance. "The obvious use for your Tipsy Tea Cup is wine or cocktails, however there are other uses for these novel creations. Perhaps place a tealight into the cup to provide subtle lighting or use it to serve your soup starter or Champagne jelly dessert to your guests or even just keep it as a decorative item. Whichever you choose we are sure it will become a talking point." And they certainly have made their mark already, gaining a Royal stamp of approval as a supplier for the feature cocktail at the Queens Coronation Festival, Buckingham Palace. The cocktail was designed by The Cocktail Lovers in association with The Kings Ginger Liqueur for this very special occasion. If, like me you love afternoon tea, try hosting your own party with these quirky creations! I'm off now to enjoy tea and cake!